All too often students learn about national heroes and not the people in their own state and communities who have made history, behind the scenes. Now students and teachers have a mechanism for teaching others about Mississippi people’s history, beyond the headlines. Where can you find this history? The pins can include photos of sites of historic note that you walk by every day and stories from people in your community. What History Should I Pin? 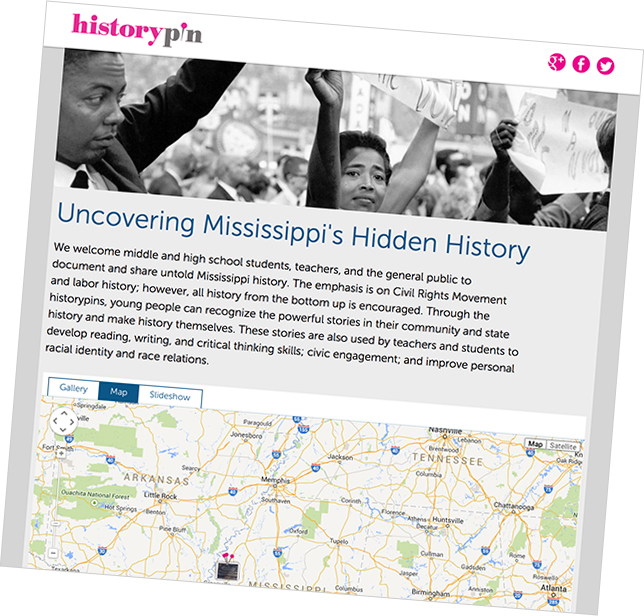 Highlight a story in Mississippi history, with a preference for stories that are not well known and that reflect the role that every day people play in shaping this country. While the emphasis will be on stories and images posted by Mississippi students and teachers, the project page is open for anyone in the world who would like to post. How Can I Pin a Photo or Story? Check out the How-To Guides to get familiar with Historypin. Here are books and online resources on how to conduct oral history interviews. Guide by Linda Wood (Oral History Association) for classroom teachers. Includes sample forms, handouts, numerous examples, curriculum suggestions and discussion questions, taken directly from real-life classroom oral history projects around the country. Tips for conducting a semi-structured oral history interview, including when to stray from prepared questions and when (and how) to get back on track from USM. Teachers’ materials from 2002 conference on incorporating oral history in K-12 curricula. Includes Oral History Teaching Guide; information on National History Day competition; and, sample curricula on “The Land and the People,” and a teaching guide on the Civil Rights Movement in Mississippi. From USM. Ten simple steps to conducting a successful oral history interview. The Youth Council undertook many activities throughout the 1960s that helped the adult leaders of the local NAACP branch meet their goals. Courtesy Mississippi Department of Archives and History, T_013_3. The NAACP Youth Councils in Mississippi laid the groundwork for the success of the more visible Civil Rights Movement in the 1960s. Here is some background on the Mississippi History Now website. Reading books such as Local People or I’ve Got the Light of Freedom will also make it clear that the Civil Rights Movement could rightfully be called a youth movement. How central were the NAACP youth councils of the 1940s and ‘50s to the success of the Southern Freedom Movement in the 1960s? How did the strength and impact of the Youth Councils vary across the state, and why? 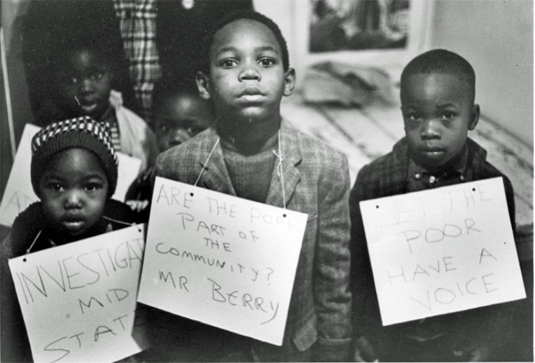 In what ways did the age of the participants impact their effectiveness in civil rights work? Here are some sources of information about Mississippi history. Opened in 2011 by Jackson State University, the Center seeks to preserve the past and foster the development of future leaders and community builders. Resources on the Southern Freedom Movement compiled by those who lived it. Includes a bibliography, timelines, photos, primary source documents, and lists of speakers. Honors the academic and artistic legacy of writer Margaret Walker through archival collections, exhibits, and public programs. A comprehensive historical agency, the department collects, preserves, and provides access to the archival resources of the State of Mississippi. An electronic publication offering a wide variety of essays on the history of Mississippi, covering the periods from prehistory through the 20th century. For the past several years, a team of student researchers has traveled with the Samuel Proctor Oral History Program to the Mississippi Delta to gather oral histories with civil and labor rights leaders. Includes digitized photographs, letters, diaries, oral history transcripts, and other documents, as well as finding aids for manuscript collections. Each summer since 1998, the Fannie Lou Hamer Institute has sponsored an institute, seminar, or workshop for educators and students interested in the history of the Civil Rights Movement. These programs — lectures, oral history panels, and field trips — engage participants in discussions with scholars and activists, and demonstrate ways of integrating primary sources about the Civil Rights Movement into lesson plans and curricula. The Mississippi Civil Rights Movement Veterans convenes an annual conference for veterans. This is an excellent opportunity for students to meet veterans, learn about history, and learn strategies for organizing today. The University of Southern Mississippi offers a list of additional resources on Mississippi history.